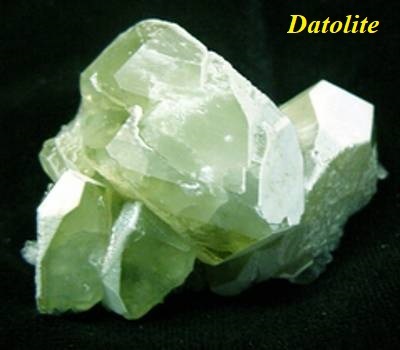 Datolite is a calcium boron hydroxide nesosilicate, CaBSiO4(OH). It is a popular mineral among mineral collectors although it is somewhat obscure. It was first observed by Jens Esmark in 1806, and named by him from δατεῖσθαι, “to divide,” and λίθος, “stone,” in allusion to the granular structure of the massive mineral. It is named after Greek “datysthai” – to divide, alluding to the granular habit of some massive specimens. Datolite crystallizes in the monoclinic system forming prismatic crystals and nodular masses. The luster is vitreous and may be brown, yellow, light green or colorless. The Mohs hardness is 5.5 and the specific gravity is 2.8 – 3.0. It occurs as a secondary mineral in mafic igneous rocks often filling vesicles along with zeolites in basalt. The type localities are in the databases of the Connecticut River valley and Arendal, Aust-Agder, Norway. 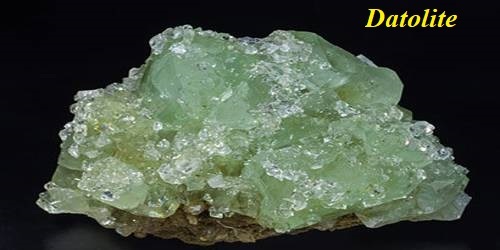 Associated minerals include prehnite, danburite, babingtonite, epidote, native copper, calcite, quartz, and zeolites. It is common in the copper deposits of the Lake Superior region of Michigan. Unlike most localities throughout the world, the occurrence of datolite in the Lake Superior region is usually fine-grained in texture and possesses colored banding. It is associated with native copper at this location and is found in porcelain-like masses and nodules. The nodules are brown to off-white in color and some are cut and polished as an ornamental stone.